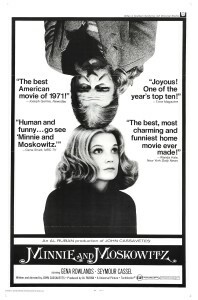 Cassavetes’ Minnie and Moskowitz is the story of a couple’s oddball romance. The basic plot is adapted from that of Marty (1955). But Cassavetes puts a wider social chasm between the two main characters. Seymour Moskowitz (Seymour Cassel) is a sub-proletariat hippie who works as a car park attendant, whose mother sees him as a hopeless case with a downward trajectory in life. Minnie Moore (Gena Rowlands) is a museum curator who rubs shoulders with wealthy art aficionados, though she comes from a middle class background. Despite characteristically uncomfortable scenes and intensely raw acting, this is Cassavetes at his most conventional and accessible. Yet this film succeeds on multiple levels, not just as a light comedy/drama. The main characters have a tumultuous relationship. There is nothing easy about them coming together. They have plenty of inhibitions, brought on by the stress and fears and discrimination and loneliness and limitations of their individual lives. It is hard for them to let go of those things, however much misery those things bring them. And the people around them are mostly selfish and rude, or just unable or willing to open up to others. Minnie, in particular, has a hard time accepting Seymour, because she is part of a much higher social strata that tends to sneer at the likes of him. Her real-life husband Cassavetes plays her (ex) boyfriend Jim, a married man who won’t leave his wife. She is surrounded by people who seem only interested in how she fits into plays for status — Jim with his stable of women or a blind date (Val Avery) trying to be less of a sad sack without a wife like a successful guy like him “should” have. But the real heart of the film is that the tumult and conflict all serves to bring two people together. Their relationship is a choice, and they choose to transcend the many, many obstacles put in its way. The sweetness of Minnie and Moskowitz is that it is a romance tale that suggests social inequities can be overcome, and that relationships can play a part in making the world a more accepting place. This is what distinguishes it from Marty, which is a wonderful movie with superb acting but one that relies upon the (essentialist) idea of characters settling for something and discovering what they “really” are and “really” want. 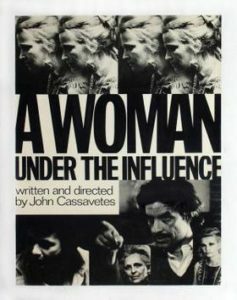 Cassavetes’ film is about the characters becoming something more than what they were at the start. That is especially true for Moskowitz, who goes from being someone drifting along on nothing more than simple pleasures to having a larger purpose. This may not be Cassavetes’ best or most ambitious work, but it is one of his most likable films.